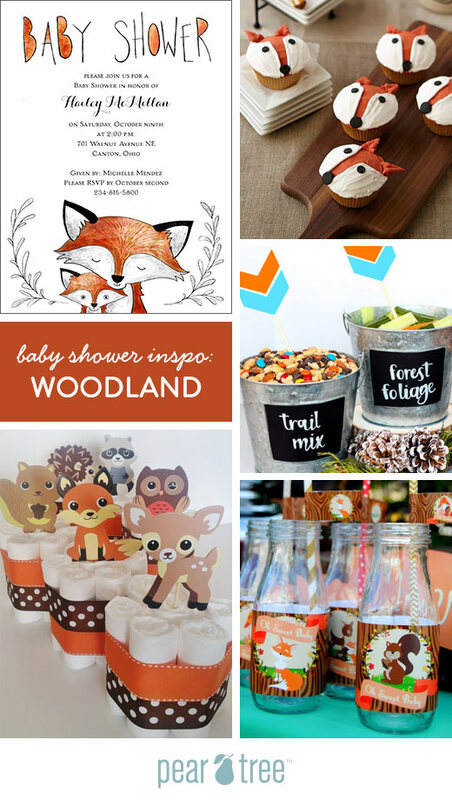 Woodland-themed baby showers are sweet, whimsical and filled with possibilities! Who doesn’t love furry little forest creatures and nature-inspired details? We’ve gathered a few of our favorite ideas to show you in this Woodland Inspiration Board. Start the celebration with an invitation as sweet as your shower theme! Take your time shopping baby shower invitations to find just the right style for the mommy-to-be and your party. Our favorite for a Woodland Baby Shower is the Fox Fun Baby Shower Invitation. The fox and baby illustration is simply the CUTEST and the crest brings a trendy element of greenery. Plus, you can use both sides of this invitation — shower details on the front and registry info on the back. Incorporating some woodgrain details is kind of a given, right? Simple touches like the woodgrain drink tags and bottle labels are perfect for adding color and cuteness. The wood cutting board shown is a great example of repurposing some kitchen items for the party. We also loved the idea of bringing some forest friends into the mix. You could do this with adorable cutouts like shown or gather stuffed animals for decoration. You can buy new, borrow from people or purchase used at thrift stores. And Finally: Food for Foraging! We really liked the idea of tying food into the woodland baby shower theme with some clever sayings or quotes. The tin pales shown with writing in chalk are perfect for setting food out so guests can graze. The fox cupcakes shown would be fairly simple to make and it’s always fun to carry a design element from the invitation into the actual shower.